Emirates and China Southern Airlines have signed a MoU to progress a comprehensive reciprocal codeshare agreement, which is set to open up new destinations for passengers travelling between China and the Middle East and Africa. The partnership with the Guangzhou-based carrier also allows Emirates’ passengers to enjoy seamless connectivity on domestic flights within China, adding eight new destinations to its global network, said a statement from Emirates. The Chinese cities covered by the codeshare agreement include Fuzhou, Chongqing, Kunming, Qingdao, Xiamen, Chengdu, Nanjing and Xi 'an during the initial phase of the partnership, subject to necessary government approvals, it stated. Passengers travelling from China will have more choice and travel seamlessly with minimum connection times, when flying to destinations in Emirates’ Middle East network such as Riyadh, Jeddah, Dammam, Muscat, Kuwait and Cairo, the Dubai carrier said. Emirates operates twice-daily flights to both Beijing and Shanghai in addition to one daily flight to Guangzhou, all operated by the Emirates A380 aircraft. 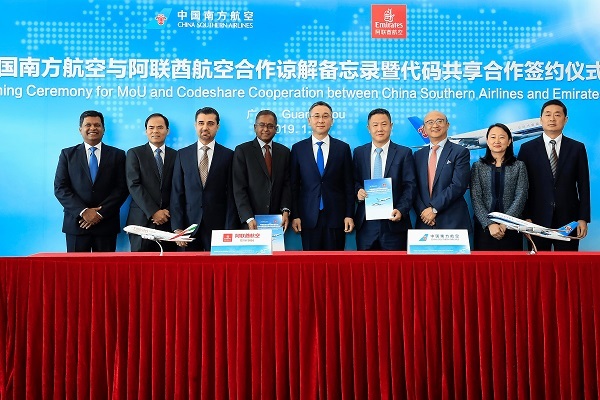 "We’re pleased to establish a partnership with China Southern Airlines, allowing Emirates’ customers to benefit from increased choice, flexibility and ease of connection to different cities across China’s provinces, by connecting in Guangzhou," said Adnan Kazim, Emirates’ Divisional Senior Vice President of Strategic Planning, Revenue Optimisation & Aeropolitical Affairs. "The addition of the eight domestic routes in the initial stage expands our reach in China, beyond the three Chinese hub cities of Beijing, Shanghai and Guangzhou," stated Kazim. “In addition to enhancing our global network, China Southern’s customers will be able to seamlessly travel to destinations within the Middle East and Africa and beyond on a single ticket,” he added. “Today’s signing is especially monumental for Emirates, as it represents the first codeshare agreement between Emirates and a China-based airline. It is also the largest airline in China by passenger numbers so we are excited by the prospects the agreement brings. This will be an important milestone in our efforts to deepen Emirates' presence in the Chinese market,” said Kazim. "Emirates is our first bi-directional partner in the Middle East, and we are very pleased to enter into a codeshare partnership with Emirates. It signifies a key step for China Southern in the process of building new international partnerships," he noted. "While codesharing is only the start of our cooperation, cooperative opportunities in a wider range of fields such as freight, frequent flyer benefits, lounge access, and airport collaboration will be explored in the future," he added.